Meet the all-new Toyota C-HR near Laconia, New Hampshire. Our dealership has taken delivery of the exiting new Toyota C-HR (Coupe High-Rider) model. This innovative new Toyota is generously equipped with standard features such as dual-zone climate control, supportive bucket seating, 7-inch audio display, 18-inch allow wheels and the Toyota Safety Sense system. It is powered by a 2.0-liter four-cylinder engine capable of 144 horsepower and 140 pound-feet of torque. The engine utilizes Toyota’s latest generation of technologies including Variable Valve Timing (VVT) and Valvematic for enhanced fuel economy and smooth operation. Unique precision-cut exterior styling and sleek, soft touch interior features set this new Toyota apart from the crowd. It offers versatile cargo space, courtesy of the convenient 60/40 split rear seat and ample space for five adults. 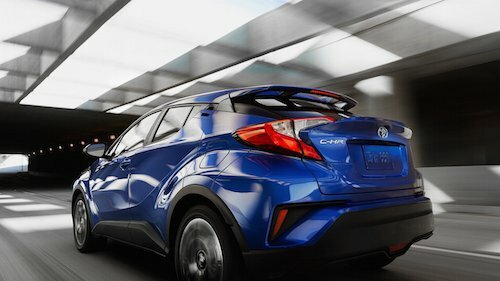 The new Toyota C-HR is offered in a variety of exterior color options, including a variety of two-tone combinations. It is offered as either the XLE or XLE Premium model with a base MSRP around $22,500. Our Toyota finance center is happy to explain your options for buying or leasing a new Toyota C-HR and can help you take advantage of current factory incentives or special offers. We invite you to explore all that this new model has to offer and take a test drive at our Toyota Dealership near Laconia, NH.